A concrete example of Project Management of complex and innovative multidisciplinary projects: within the terms of the Management of the Technology Park of Policlinico Gemelli, Medipass took part in the construction of the new hybrid operating room, inaugurated on October 30th 2014. October 30th 2014 is an important date for the partnership between Università Cattolica del Sacro Cuore and Medipass, marking the launch of a special operating room in the Department of Cardiovascular Sciences of Policlinico Gemelli in Rome, headed by Prof. Filippo Crea. Among those present, Rector prof. Anelli, the Head of the Policlinico Dr. Guizzardi and a special guest: Luca Cordero di Montezemolo. It is a multifunctional space that seamlessly combines surgical and dianostic processes and provides a highly sophisticated, advanced and minimally invasive technology, as prof. Massimo Massetti, Director of the Department of Cardiosurgery, describes it. The guiding principle of this facility, that revolutionises surgery procedures, is the perfect synchronisation between the operating table, with state-of-the-art cardiosurgical equipment, the laboratories of haemodynamics and electrophysiology and medical imaging diagnostic equipment. In the same room, a state-of-the-art angiography unit with a robotic arm provides quick and easy access to the operating table. The simultaneous multidisciplinary activity involving different roles (heart surgeons, vascular surgeons, cardiologists, radiologists, haemodynamics specialists) explains the designation of “Hybrid Room”. 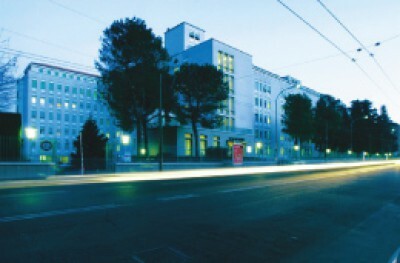 To discuss the high level of innovation, the workshop "Assessment, planning and implementation of the new hybrid cardiovascular room" was held on the same day by the Italian Association of Clinical Engineers (AIIC), recognised as a CV-enhancing conference by the National Council of Engineers (CNI). The event was coordinated by Medipass within the terms of the MES for the Management of the Policlinic’s Technology Park, comprising about 50 high-tech machines.